Photo: Families meet the fish that live in the harbor at Harbor Fest. Photo credit, Will Archer. Japanese equipment manufacturer Komatsu has announced a nearly $300 million project to build a new manufacturing and headquarters facility on the former Milwaukee Solvay Coke & Gas Co. site. The facility will produce mining drills and shovels similar to - but even larger (!) than - the large rope shovel at National Avenue and Miller Parkway. 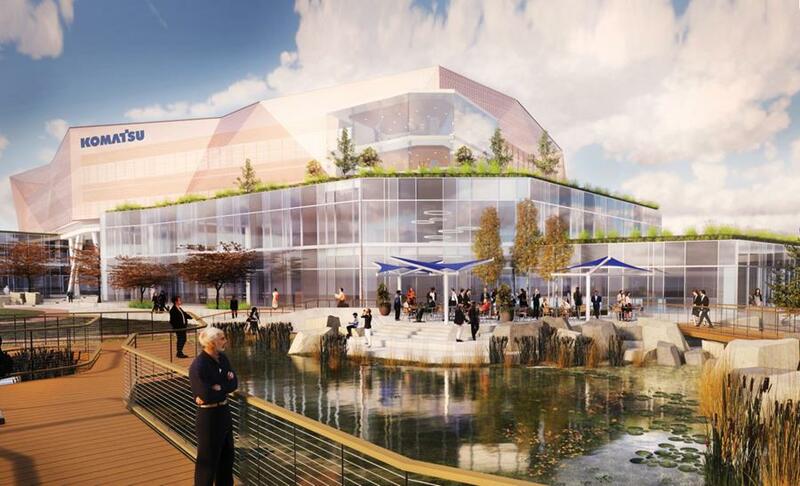 The development would create hundreds of new jobs and include a public waterfront. As part of the project, the City of Milwaukee is proposing the ​creation of a TIF district which would fund the longest single extension of the river walk system in city history. Mandel Group announced a $130 million, 4 acres, mixed-use development along the Milwaukee River on S. Water Street. The new development will include a Riverwalk and a riverfront plaza. Michels Corporation has proposed a $100 million development along the Kinnickinnic River where the Horny Goat Brewery used to be. The proposal includes offices, housing, a hotel, a public Riverwalk, and aims to bring roughly 400 new jobs to the area. Just west of the river from the new Michels site, the Pier Milwaukee Marina was sold to a new marina operator. There is even more real estate activity on the Kinnickinnic River as Wangard Partners, developer of Freshwater Plaza at 1st and Greenfield, may purchase the property at 1958-1970 S. First Street. Klement's Sausage, on the southern edge of the Harbor District, announced a $7.5 million expansion of their facilities. 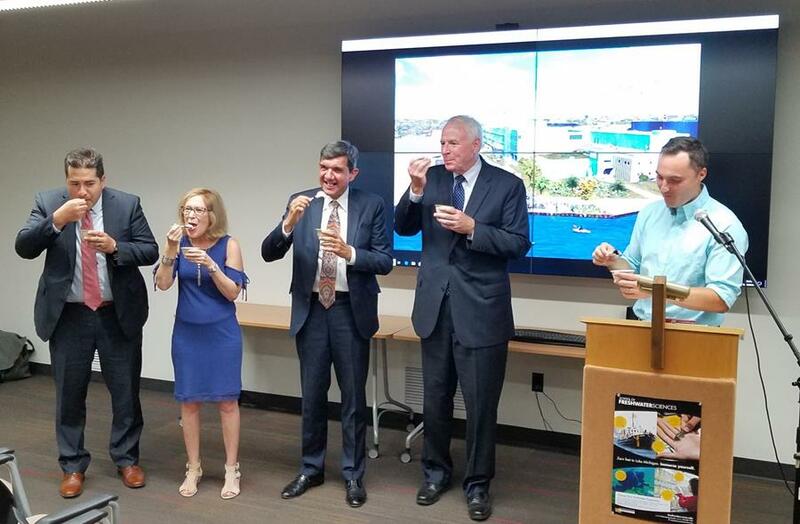 From left to right: Ivan Gamboa, Tri City National Bank; Karen Schapiro, Brico Fund; Gary Ballesteros, Rockwell Automation; Mayor Tom Barrett, City of Milwaukee; and Dan Adams, Harbor District Inc.
Construction on Harbor View Plaza began at the end of the summer with a ceremonial groundbreaking... of ice cream (pictured above). Photo: Altius Building Company breaks up old concrete to make way for new structures. Harbor View Plaza is under development at the east end of Greenfield Avenue and will be the first waterfront public park within the nine miles of waterfront located in the Harbor District. The Plaza includes a canoe/kayak launch, a water feature, and a play structure for children and families. The plaza will be the go-to destination for Milwaukee residents and visitors interested in watching Lakers and Salties load and unload at Jones Island. 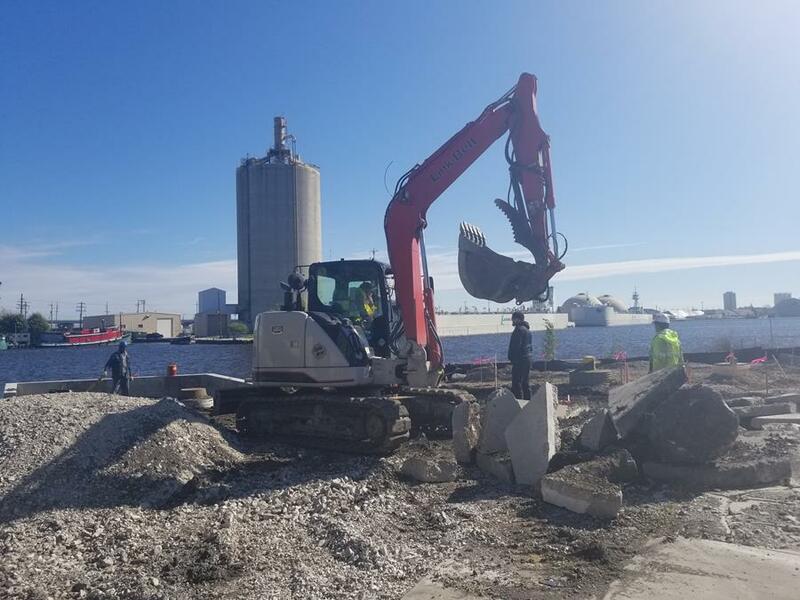 Harbor View Plaza will provide a relaxing place to sit, eat lunch, or bring your children to play and experience Milwaukee’s working waterfront. 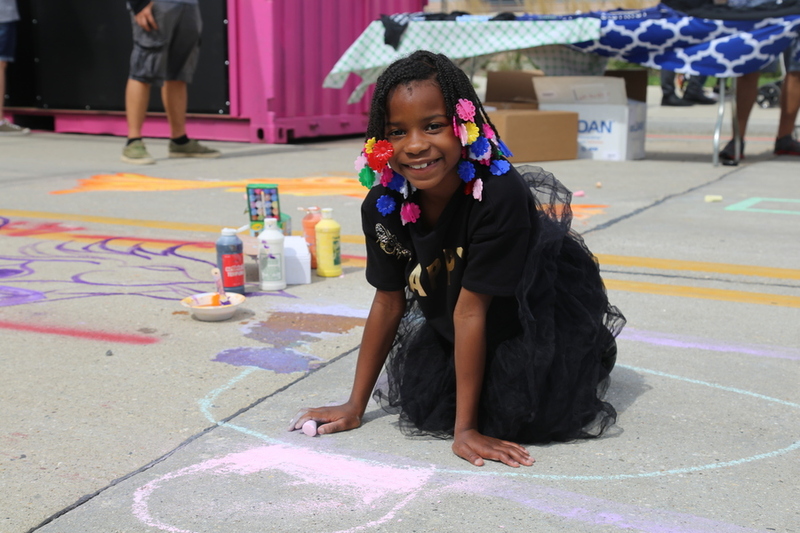 With a lack of public park and green space on the near south side, Harbor View Plaza provides a new place for families to recreate and will reconnect south side residents to the waterways only blocks from their neighborhood. 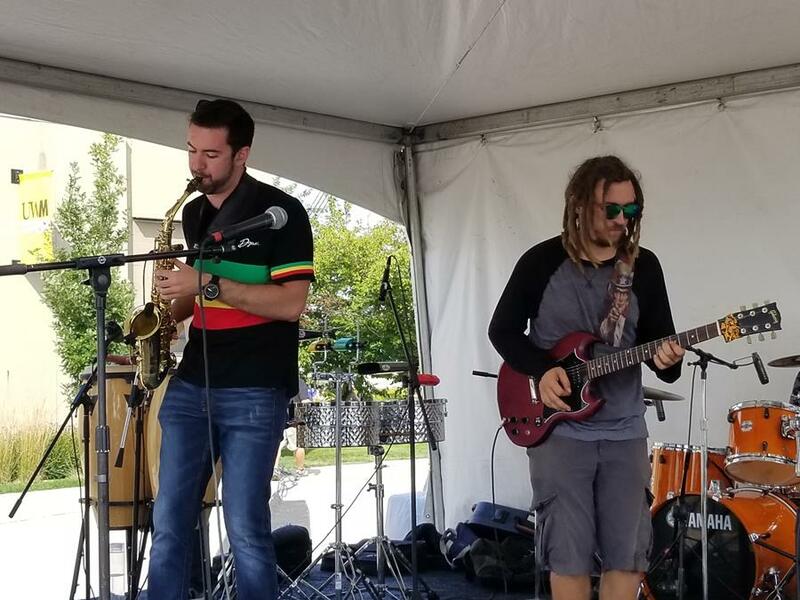 Thanks for a great Harbor Fest! 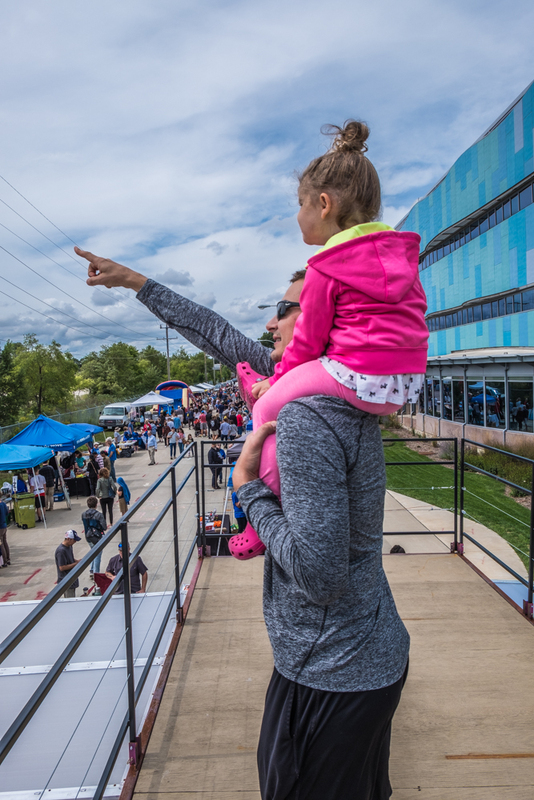 Harbor Fest came and went on Saturday, September 8th drawing over 1,500 people to the water's edge. It was a beautiful day, which helped bring out more people to an area often perceived as off-limits. As people walked through the festival, they were impressed by all the local and water-based education booths. 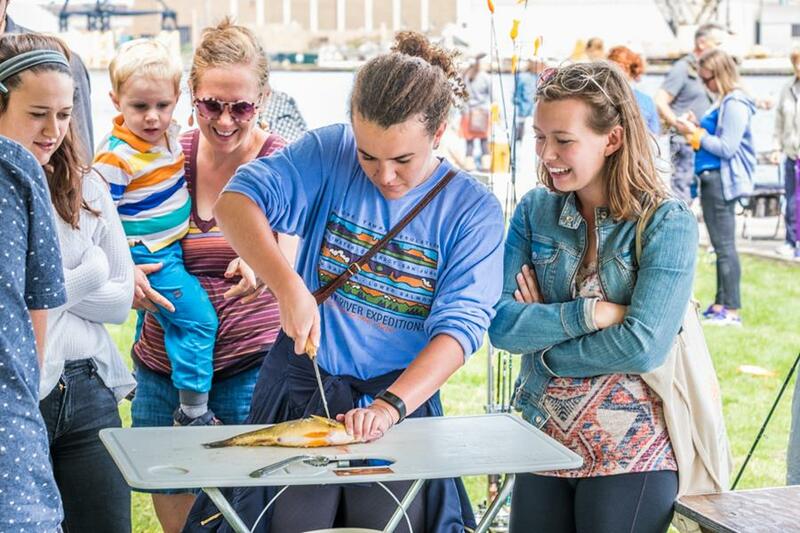 This family-friendly festival set itself apart with a number of scheduled activities, tours, and workshops like a bike ride, butterfly walk, tours of the School of Freshwater Sciences, Free Boat Tours, and fish filleting lessons. 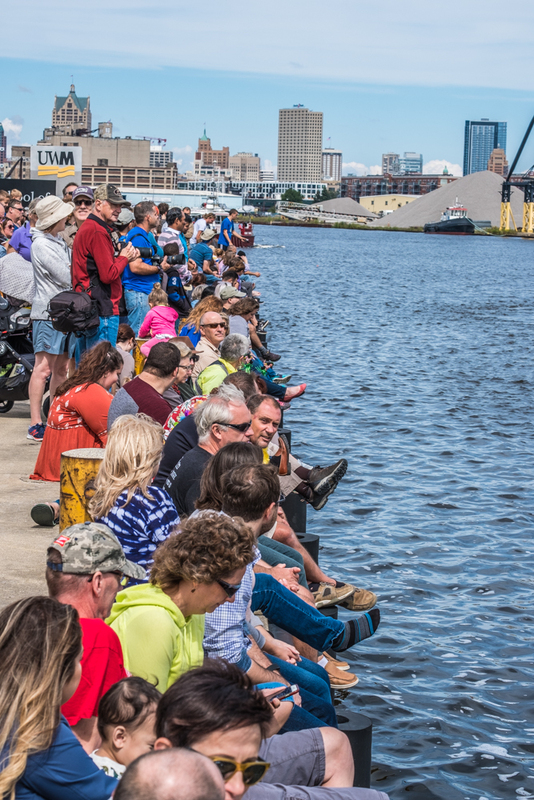 Many gathered at the water's edge to watch the main event; Milwaukee Riverkeeper's annual boat parade. They watched as a dozen decorated boats displayed their artistic boat floats. 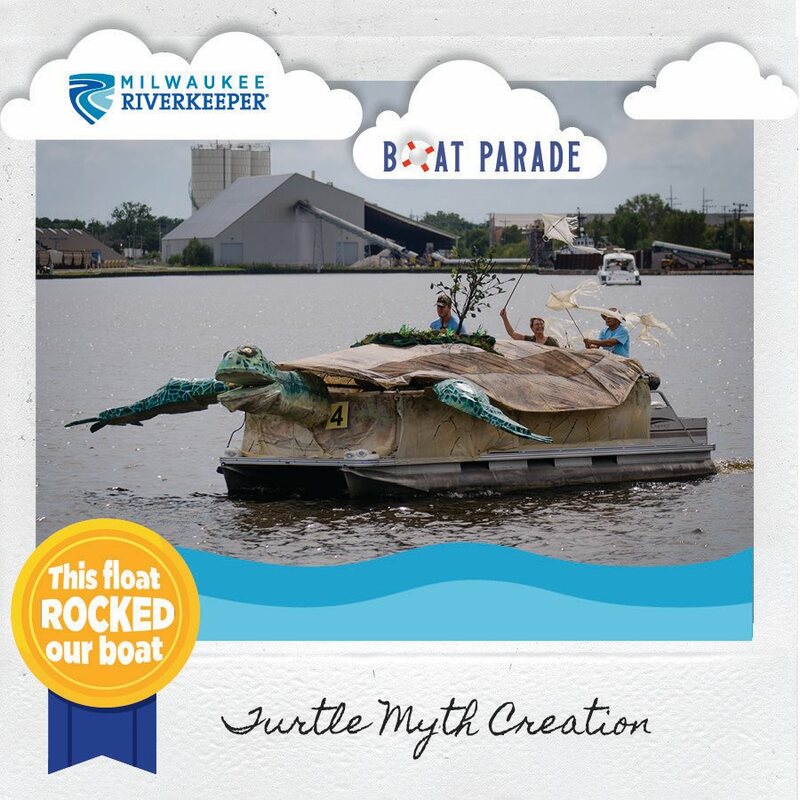 ALL of the beautiful parade floats were STUNNING, but one float really ROCKED the boat: Congrats to the Turtle Myth Creation team!!! People enjoyed throwback tunes by True Skool DJ Hala, African inspired beats by Sindoolaa, and Latin-Reggae jams by They GuanUs. We hope to see you at next year's Harbor Fest. 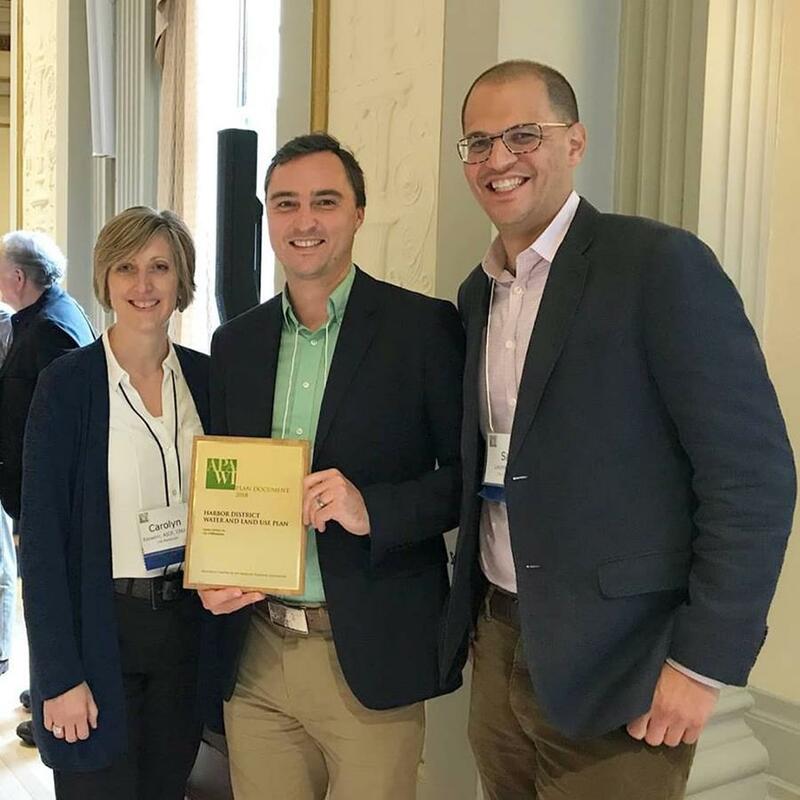 We are excited to announce that the Harbor District Water and Land Use Plan (WaLUP) has received a Planning Excellence Award from the Wisconsin Chapter of the American Planning Association. The award was presented at the American Planning Association - Wisconsin Chapter Conference in Madison in early October. Award jury members commented "the public participation approach was innovative and effective . . . it was good that a leading agency other than the City was involved . . . consideration for other elements are things that planners need to start including." The WaLUP was the culmination of a two-year planning process led by Harbor District, Inc. and the City of Milwaukee Department of City Development with contributions by Sixteenth Street Community Health Centers, UWM School of Architecture and Urban Planning, Port Milwaukee, SEH, Inc., Gensler Design, AECOM, Big Lake Data, and many others. 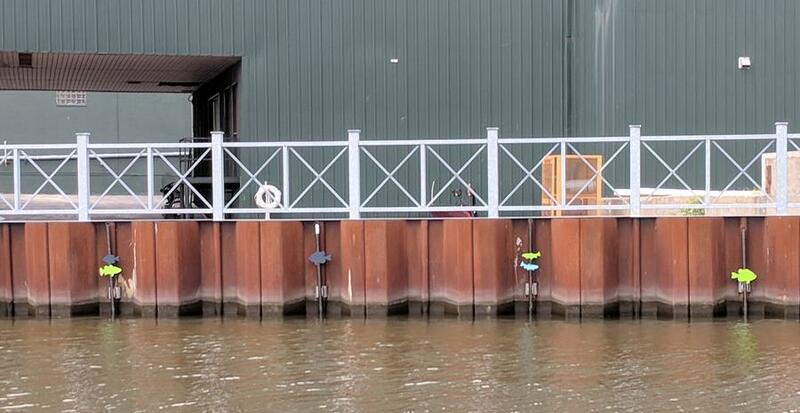 Funding for the planning process was provided by the EPA, Wisconsin Coastal Management Program, NOAA, WEDC, Milwaukee County, MMSD, Brico Fund, Fund for Lake Michigan, Rockwell Automation, and We Energies. To view the WaLUP visit harbordistrict.org/plan. The Shepherd Express caught up with Harbor District's Water Projects Manager, Lindsay Frost, for a conversation about Habitat Hotels. Check out Harbor District executive director Lilith Fowler giving Bobby Tanzilo from OnMilwaukee a brief video tour of the Harbor District via Facebook Live. 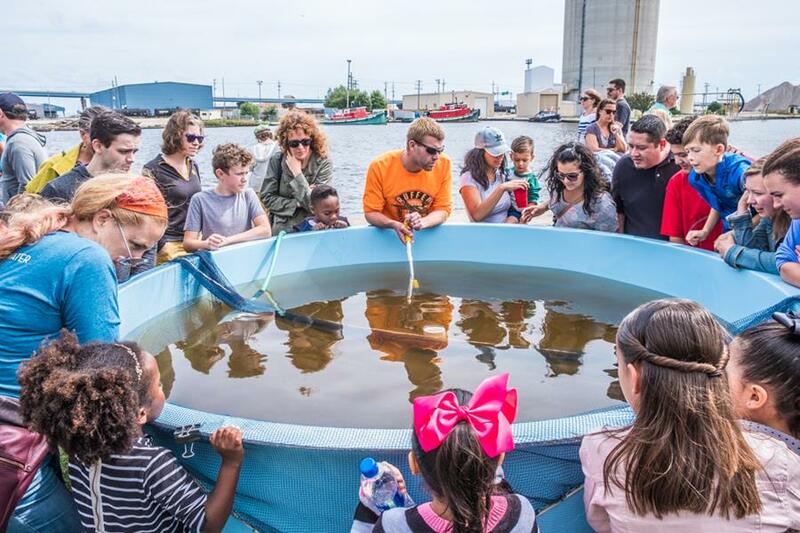 Great story from WUWM 89.7 FM - Milwaukee's NPR highlighting the partnership between Harbor District Milwaukee, University of Wisconsin Milwaukee School of Freshwater Sciences, and Bradley Tech High School to create habitat for fish and aquatic plants in the harbor through habitat hotels. If you are hiring in the Harbor District and want to get the word out, email us by clicking the Job Ad button. A healthy harbor is a harbor that hires locally. V. Marchese, Inc., the premier supplier of Food Service Products in Wisconsin, is looking to fill full-time positions for a Route Driver and Warehouse Selector. Established in 1932, this family owned and operated business offers an environment for continued growth that rewards hard work and dedication. This growing business is almost always hiring. If you or someone you know needs a job, click the button below for an application.